Why I’m Excited about the NEW Digital Cookie!! Cookie Season just started!! This year GSUSA created a new way to sell cookies…online. 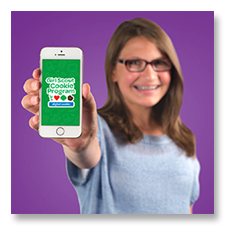 I’m so excited because now Girl Scouts like me, with help from GSUSA, can create a website and video to help us sell Girl Scout Cookies. And, even better, my family and friends can buy Girl Scout Cookies from me online! Digital Cookie is great for many reasons! First, increased cookie sales! I have a lot of family and friends that live far away, people who normally might not have purchased from me because the whole ordering and shipping process was too complicated. With the new online program, they can now order from me and pay online. When they order, the cookies will be shipped directly to their home. One of the biggest parts of the Girl Scout Cookie Programs is setting a goal. On my cookie website, I can post my goals for the cookie season for all of my customers to see and people can see how close I am to my sales goal. If someone sees that I am a few boxes away from my goal, they would probably purchase more cookies to help me reach my goal. Cookie customers can learn more about my cookie campaign. They can learn what I am going to do with my cookie credits, what I have learned from the program, and the 5 skills of selling cookies. I think one of the best parts about the new online program is that I learned how to create a website! This is a skill I can use this as I get older and get a job. I know I will when I am in business. Martin Luther King had a dream. As Girl Scouts, we dream a lot. What’s your dream? You might dream of owning an animal shelter, being a musician, or even being a better friend. What do you think you need to do to reach your dream? Share your dreams with us by January 16th to zippere@gsnc.org and you may see them somewhere special. Think back to a time when you were your girls’ age and an adult made a choice for you. Maybe it was what you had for lunch, what club or sport you should have joined, or what instrument you played. Were you excited about that choice? Probably not as much as if you had a role in making the decision. The same goes for your girls. If you let them have a role in choosing what dream to follow, they’ll be more successful and have a lot more fun. Does your group need a little structure to help get their ideas flowing? Try giving them a few “feelings” words to think about – happy, safe, loved, healthy, etc. Discussing one word at a time, ask girls what they can do to help people feel that way. For example, how can you help a person feel happy? Why would a person not feel loved? How do you think we can help people feel healthier? Let this lead into one or a few project ideas. If you need to save time, you might want to give girls a few options and let them vote on the one they like best. It’s certainly not as ideal as letting them come up with the ideas on their own, but they’re still getting a role in making the decision. With the kick-off of the new Digital Cookie program, GSNC’s Marketing team decided to share our favorite tips for Digital Marketing. But, before you can start marketing your product, it’s important to set your goals, make a plan, and discuss your goal and plan with your business support team (aka your family members who are there to help you). Just remember, when working online, be sure to have your parent’s permission, take GSUSA’s Internet Safety Pledge, and be aware of the Stop.Think.Connect Cybersecurity Campaign. Get creative on your Cookie Site. Come up with a fun and catchy video that you can post on your Digital Order Card. Include your goals and what you will learn by taking part in the Girl Scout Cookie Program…. Videos and photos of you with Girl Scout Cookies are great for sharing on social media. Get Social. Are your parent’s social media users? Then let their social media friends know that you are selling Girl Scout Cookies and that if they would like to purchase cookies, you are their #cookieboss. If you created a personal sales pitch for your Digital Cookie site, share that video on your social media pages… you worked hard on that video… share it! Update your cover images on your social media pages to let people know that it is Girl Scout Cookie Season… visit our Facebook page and borrow some of our cover photos. Why should people buy Girl Scout Cookies from you? Alternate options to buying and eating Girl Scout Cookies… aka donate a box… or a case for Operation Cookie. Tell them to keep an eye out for your email from the Digital Cookie Site… or if they would prefer, they can order from you in-person. If you don’t hear back from someone, follow-up with a phone call.